Good. So all us women have to do is educate ourselves for leadership positions and go for it. But no. We had a capable, educated, talented negotiator as a Prime Minister, but she was female. And now we are collectively going to change the public record, and say she was shite, right in front of my eyes. Right here and now, we are going to change the truth. And everyone will go blindly along with it. I used to think it happened secretly, when be wrote history books. But no, it happens openly, actively. So take heart, everyone who has ever had a big lie told about them: you are now in very fine company indeed. 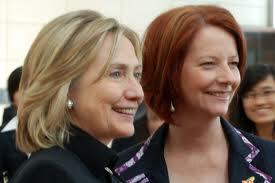 In the 17 days since she was deposed Julia Gillard has been thoroughly trashed.[..] Laura Tingle even referred this week to “the Gillard experiment”, implying the ALP won’t be going there again. Meaning what? No more women? Or lawyers? Or single, childless, atheist Welsh redheads?